Cooking has got to be one of the most relaxing things that you can engage in. Even after a long day at work, just fiddling around in the kitchen can help you melt all that stress away. Not to mention the fact that you have something wonderful to look forward to when you’re done! That is, if you like eating – but who doesn’t? Also consider the fact that the media is also placing a lot of attention on cooking and recipes, it is thus no big surprise that more and more people are spending their time discovering different things to make in the kitchen. With the abundance of celebrity chefs, their own cooking shows, and recipe portals, the average person also gets more enticed to experiment more than usual with their cooking. The trend, it seems, is for people to make these recipe web sites their go-to solution when in need of ideas for dishes. Even those who are already experienced in the kitchen still make it a point to visit recipe and cooking web sites for inspiration. And when it comes to recipe web sites, there is a ton to choose from. There is, however, a new player in the scene which can give you more than your usual recipe web site: Recipe Finder. It has the largest collection of recipes – over a million of them! And in spite of this humongous collection, you can still find your desired recipe very quickly. Finding a recipe is a simple matter of entering the recipe name or the main ingredient. But if you want things to be more specific, you can also narrow down your search by indicating ingredients that you want to be excluded, calorie count, cook time, and the number of servings. You also have control over how you want the recipe results to be displayed – either as text or as images. 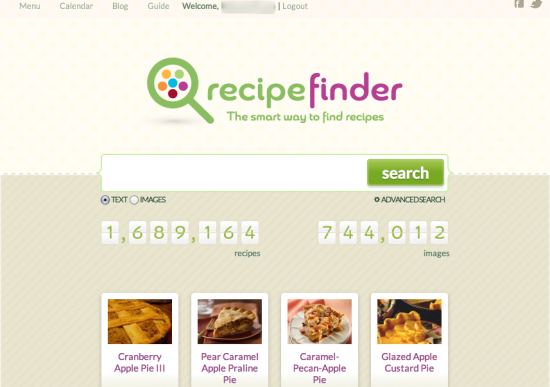 Recipe Finder does not overlook the social aspect that many users look for today. For recipes that are simply too good to keep to yourself, they can be shared via different platforms. More so, the recipes can also be printed out – the perfect choice for those who still want hard copies! The recipe search engine is not simply about discovering recipes and sharing everything you cook and eat with your online friends. It also gives you some help in the organizational front via two features. One, you have the menu feature, which allows you to create your own menu. This can include the appetizer, main courses, and dessert. Two, you have the calendar feature, which helps you plan entire meals in advance. So what do you say? Why not make yummy use out of that laptop? Check out Recipe Finder! Girl Scout Cookies are an icon of American culture. They’re also the backbone of the Girl Scout Cookie Program, the leading entrepreneurial program for girls. 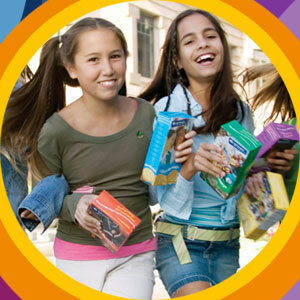 The Girl Scouts of America built a site on MySpace to sell cookies. That’s all fine and dandy, just don’t let the scouts themselves anywhere near the site. We need to keep some innocence in America don’t you think? Especially with the Girl Scouts. I also prefer going to my local super market when the time comes to buy Girl Scout cookies… to help support the local troops in my area… again, this is part of American culture, wouldn’t you agree? 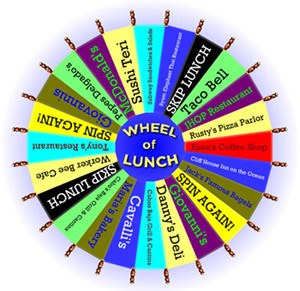 Spin the Wheel of Lunch! Do you ever have trouble when it comes time to eat and you just can’t make up your mind? So many choices but where to eat? All you do is enter your zip code and a query string, such as lunch, steak or vegetarian and the Wheel will discover many of the local establishments that fit the bill. This is so cool! I love mash-ups. Thanks to KrazyDad for putting this together. I love eating salads. The all you can eat salad bars are so yummy…. 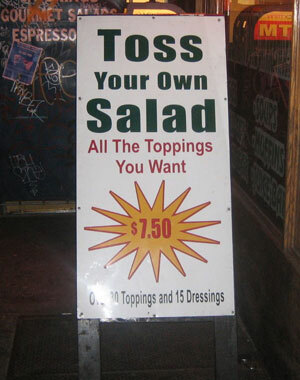 so I was wondering, do you toss your own salad?